In an instant, Kevin Harvick’s engine jumped from 9,500 rpm to over 12,000. Normally, an over-rev of that magnitude is like a lightning strike inside the engine. Harvick held his breath, fearing the worst – but his Ford FR9 engine never missed a beat. You’ve probably never seen a guy so happy to finish second at the Pocono 400. For Ford fans, there was more good news. 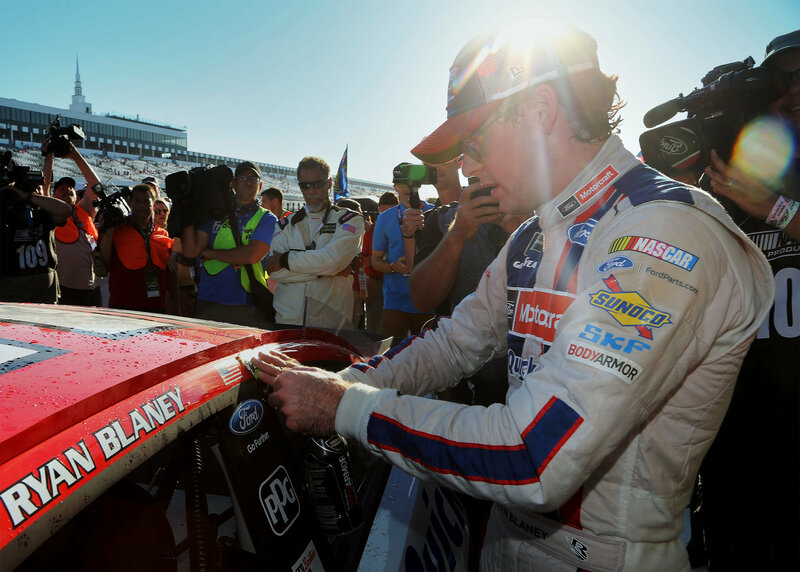 Wood Brothers Racing driver Ryan Blaney, the guy who won the race, is also a Ford driver. It was the first Monster Energy NASCAR Cup Series win for the second-year driver – and the 99th win for Wood Brothers Racing – in what is shaping up to be a promising career. All in all, it was a banner performance for Ford drivers, who swept four of the top five spots. 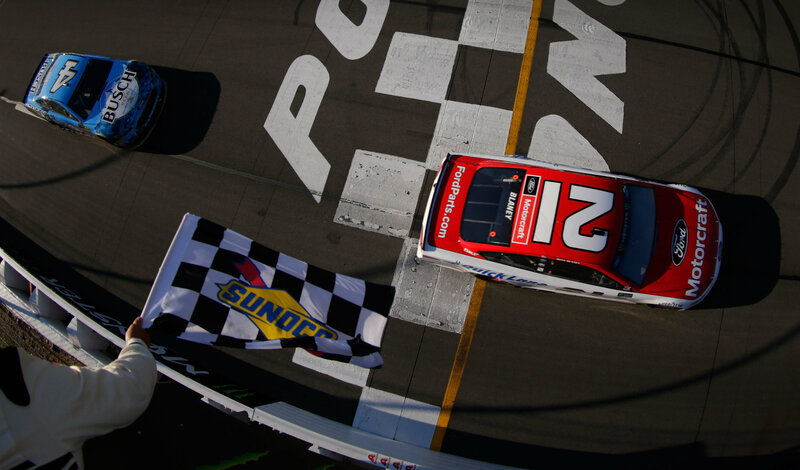 Ryan Blaney takes the checkered flag at the Pocono 400 for his first Monster Energy NASCAR Cup Series win. Photo courtesy of NASCAR. It was also a sign of things to come. Fueled by the addition of Stewart-Haas Racing in the offseason, Ford got off to a fast start in 2017. Kurt Busch, driving the #41 Fusion for Stewart-Haas, won the season-opening Daytona 500. And that was just the first race. With eight Monster Energy NASCAR Cup Series wins and five Ford drivers qualified for the playoffs, 2017 is shaping up to be a memorable year for Ford Performance, Roush Yates Engines, and the teams and drivers who run the Ford FR9. It’s a story that started before today’s young drivers were born. Ten-year-old Doug Yates really wanted that go-kart. It was just sitting there, unused, in the backyard of one of his lawn-mowing customers. There wasn’t anything fancy about the kart itself, but it had a beautiful Tecumseh motor, seven-horsepower, and that’s what really mattered. It was only natural that Doug – who today is president and CEO of Roush Yates Engines – was drawn to an engine like that. His dad is Robert Yates, one of the best engine builders in North Carolina – which meant he was one of the best in the country. Robert started his career working for Holman Moody, building engines for Ford NASCAR teams, and from there went to work as engine builder for racing legend Junior Johnson. For Robert, it wasn’t just a job, it was an all-consuming passion. Doug’s dad has one of the most glittering NASCAR résumés you’ll find in the sport. As an engine builder, Robert boasts 77 race wins. As a team owner, he’s collected 57 more checkered flags. His teams have won the Daytona 500 five times and collected a Cup Series championship. The list of drivers who have benefitted from his expertise includes legendary names like Junior Johnson, Bobby Allison, Cale Yarborough, Richard Petty, Dale Jarrett, and more. 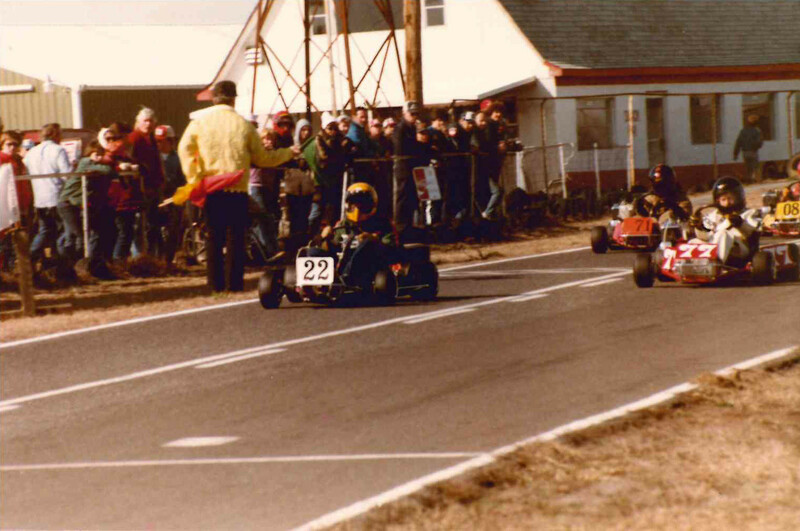 After earning his first go-kart cutting grass at age 10, Doug Yates, in the 22 kart, moved up to real go-kart racing at age 13. Photo courtesy of the Yates Family. In 1984, the summer before his senior year, his dad opened his own engine shop, and Doug joined the family business in earnest. It also motivated him to go get a formal education and see what other opportunities were out there. So he went to North Carolina State University and earned a degree in mechanical engineering. 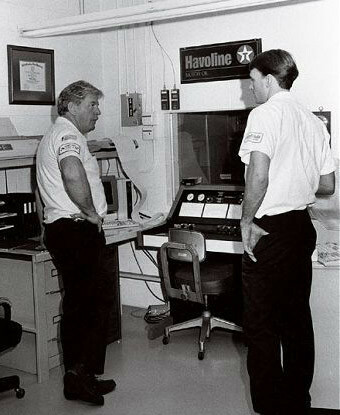 Robert and Doug discuss dynamometer testing at the original Robert Yates Racing shop in Charlotte, N.C., in 1991. Photo courtesy of the Yates Family. After graduation, Doug weighed his options. He knew the right place for him was back in the family business of racing, where he could fulfill his lifelong dream of creating a world-class engine shop alongside his dad. As a car owner, Roush has won two Monster Energy NASCAR Cup Series (formerly Sprint Cup) championships, five Xfinity Series (formerly Nationwide) titles, and one Camping World Truck Series championship. All in all, since 1988 his teams have won well over 300 NASCAR victories in the three series, making him the winningest owner in NASCAR history. In 2003 Toyota was getting ready to bring their racing program to NASCAR’s premier racing series. The Ford teams knew Toyota would provide some stiff new competition, and they wanted to be ready to keep them at bay. Could an unlikely partnership between two intense rivals be the answer? They both worked on Ford engines, but for competing teams in the win-at-all-costs world of racing. The two teams had their differences over the years; racing hard against one another every week – each wanting to be known as the best – will do that. But the two racing legends also realized the great potential a combined effort had to offer. Less than three months later, in the first Cup Series race for the new team, two Roush Yates Engines-powered cars, driven by Greg Biffle (from the original Roush Racing team) and Elliott Sadler (from the Robert Yates Racing team), were sitting side-by-side on the front row of the Daytona 500. It was a great start to what would prove to be a winning partnership. As a kid, Dan Keenan, Design & Analysis Manager at Roush Yates Engines, loved fixing things, tearing things apart, and figuring out a way to build something new. But he never dreamed his skills would one day lead to being a key player in designing a brand-new race engine for NASCAR. After earning a mechanical engineering degree from Montana State University, he started working on dynamometers. His expertise got the attention of NASCAR race teams, and in 2000 he joined the team at Robert Yates Racing. 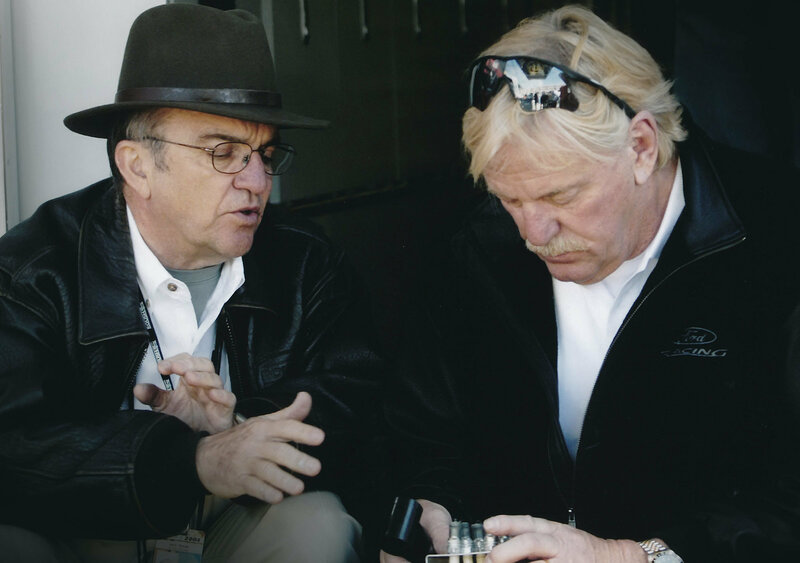 In 2007 Doug asked him to team with Ford Performance to spearhead the design of Ford’s first purpose-built, made-from-scratch NASCAR race engine, the Ford FR9. The plan was to start from scratch, with a clean sheet of paper, and build a motor from the ground up. The R452 won a lot of races over the years. It first made its mark with what’s commonly known as the “Yates head.” Officially called the C3, this innovative new component, designed by Robert Yates, created such a giant leap in power – more than 50 hp – that NASCAR considered outlawing it. Ultimately, officials told Robert his cars could keep running it, if they made the technology available to other teams, as well. And so they did. A key challenge for the Ford FR9 engine: being better than the very successful engine it would replace, the D3 R452 V8 (pictured). 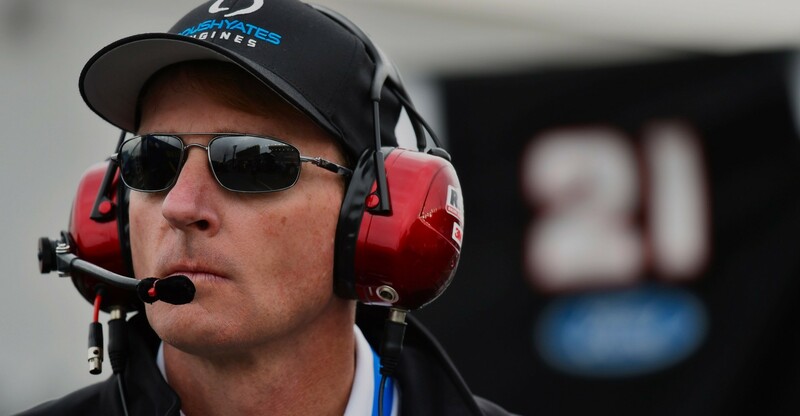 Ford sent Dave Simon, Ford Performance Motorsports Powertrain Supervisor, to North Carolina, where he spent the next several years working closely with Keenan and his team, developing the engine program and a strong partnership along the way. The plan was to start from scratch, with a clean sheet of paper, and build a motor from the ground up. Job one was figuring out the primary goals for the new engine. NASCAR, of course, was involved as well, providing specifications and guidelines that must be met for the engine to be approved. They started at the top of the engine and worked their way down, adding parts as they went. And the more you add, the harder it gets. “Once you decide something, your design freedom gets a little bit smaller,” Keenan explains. “You decide where your valve lifters are going to be, your freedom gets smaller. You decide what your valve angles are going to be and you lose a little freedom. So we prioritized what was the most important for power and those were the things we were going to have the most design freedom with. “A lot of times, our engineers will create a part that requires a very special machining process,” says Jeff Clark, Roush Yates Engines Vice President of Sales. “We relied on premium-based inventory tooling from our partner Mitsubishi Materials USA. From there, the team started printing out parts and bolting them onto a mockup of the new engine. Meanwhile, as additional time, attention, and resources were poured into the new engine design, nothing else slowed down. Races still took place every weekend. Dozens of new engines still needed to be built every week. And the R452 was still winning races. In fact, Carl Edwards, driving the #99 Ford for Roush Fenway, finished the 2008 Cup season with a series-high nine race wins. It was the last year of the R452 engine – talk about going out on top. When the day finally came to fire up the first Ford FR9 engine, a crowd gathered around the dynamometer, Simon recalls. “I don’t know what we expected, like streamers to fall from the ceiling or something. The guys hit the button, it fired right up – of course it did, we had worked so hard on it. And then we all kind of looked at each other, ‘All right, it idles!’ And then we all went back to work. But it was still a pretty fun moment to hear it fire up for the first time.”Eventually, Doug made the call to stop developing the R452 and focus exclusively on optimizing the FR9. Trying to develop two engines at once was slowing things down, and he knew the FR9 wouldn’t be fully ready until some real pressure was applied. As always, Roush Yates Engines relied on important partnership relationships to overcome key challenges and keep improving the engine. For instance, the team worked closely with long-time partner Cometic Gasket to design and develop a new head gasket system. Once you have a real, working engine that runs, sophisticated testing is key to making it run better, longer, and faster. These days, though there’s no real substitute for rigorous on-track testing, that often means using computer simulations to narrow down the number of components you need to take to the track. This high level of computerization is not something that came easily to the sport. Early days with Robert Yates at the track. Robert Yates and Davey Allison, Pepsi 400 Victory Circle at Daytona International Speedway. Photo courtesy of NASCAR. 2004 Daytona 500 – Pole winner Greg Biffle (Roush Racing) & Elliott Sadler (Robert Yates Racing). 2008 Carl Edwards for Roush Fenway Racing team pitstop at Texas Motor Speedway. Photo courtesy of NASCAR. 2010 Ford FR9 first win, Pocono Raceway, Greg Biffle of Roush Fenway Racing. Photo courtesy of NASCAR. 2011 Daytona 500 winner, Trevor Bayne for Wood Brother's Racing. Photo courtesy of NASCAR. 2011 Daytona 500 Victory Lane, Trevor Bayne for Wood Brother's Racing. Photo courtesy of NASCAR. Roush Yates Engines Facility – Mooresville, NC. Roush Yates Manufacturing Solutions – CNC parts manufacturing facility - Mooresville, NC. Lab to track advanced testing capabilities. Over 300 checkered flags line the walls of the Roush Yates Engines facility. Roush Yates Engines' Mike Messick, NASCAR trackside support. 2017 Robert Yates – NASCAR Hall of Fame Inductee. Doug Yates and No. 2 Team Penske driver Brad Keselowski. 2017 Sonoma Raceway, Save Mart 350 winner, Kevin Harvick of Stewart-Haas Racing. Photo courtesy of NASCAR. 2017 Daytona 500 winner, Kurt Busch of Stewart-Haas Racing. Photo courtesy of NASCAR. Jack Roush listening to race communications. Photo courtesy of Roush Fenway Racing. “Old school racers didn’t want engineers. They didn’t really want new technology,” Clark adds. “But Doug embraces it and maximizes it to make our engines more durable, more powerful. And to help you understand, when you make a change and get a horsepower increase, why it happened.”Back in the day, he explains, testing was mostly trial and error. If something worked better, you kept it – but you didn’t necessarily understand why it worked. And it might take 100 failures to find one solution that worked. Today, the success rate is much higher because you’re able to eliminate a lot of bad options before they make it to the track. He credits the visionary leadership of Doug Yates with helping the company make great strides in this area. “Doug has really taken a technical approach, an engineering approach, and made the percentage of gain more substantial,” Clark explains. “He brings both the legacy and accumulated knowledge of the pioneers of racing, combined with a vision to keep moving forward as things change.”From a driver’s perspective, this combination of old-school wisdom and cutting edge technology could not be more valuable. Key to this process for Roush Yates Engines is their partner Convergent Science, which provides Computational Fluid Dynamics programs to simulate the flow of fluids through the engine. 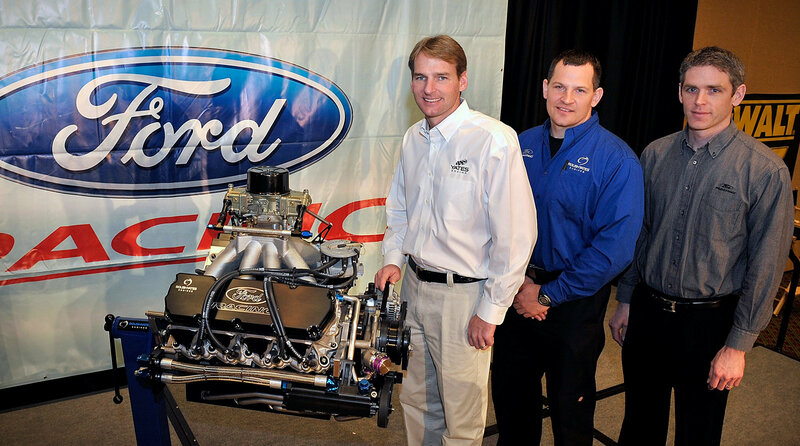 Three key players in the development of the 2009 Ford FR9 Engine: Doug Yates, Dan Keenan, and Dave Simon. One high priority for the Ford FR9 engines was building a superior cooling system, one that would allow the engine to produce maximum power at higher operating temperatures. This lets teams run with more tape on the grill, diverting more air flow to create downforce. More downforce translates to better grip and higher speeds in the turns. It also helps at the two restrictor-plate superspeedways, Daytona and Talladega, where cooling airflow is often compromised by long stretches of running nose-to-tail. The first official FR9 points win came later in 2010 at Pocono, where Greg Biffle took the checkered flag for Roush Fenway Racing. It was a milestone moment for Ford Performance and Roush Yates Engines. In 2011, Ford cars swept the first three spots in the Daytona 500. Trevor Bayne, a 20-year-old rookie, took the checkered for Wood Brothers Racing, Carl Edwards (Roush Fenway Racing) took second, and David Gilliland (Front Row Motorsports) took third. Overall, it’s the unmatched combination of power and reliability that makes the FR9 engine a driver favorite. Mary Ann Mauldwin, Roush Yates Engines Chief Operation Officer, didn’t come to the motorsports industry by the conventional route. It was systems and processes, not horsepower and pistons, that drew her in. But today it’s her expertise that helps make RYE not just a premier racing organization, but a premier manufacturer achieving AS9100 certification at their CNC manufacturing division, Roush Yates Manufacturing Solutions. In 2004 her career, and her life, took a hard, high-banked left turn. “I got a call one day,” she explains. “This person said, ‘I have a friend who works for a company in North Carolina, and they’re looking for some help with their materials management and wondered if you might be able to help us find someone.’”That “friend” turned out to be Doug Yates. And before Mauldwin knew it, Yates was offering her the job, where she was quickly impressed by his action-oriented approach. Just last year, Mauldwin and her team implemented a new ERP (Enterprise Resource Planning) software solution from RKL eSolutions, one of RYE’s newest partners. The solution assures consistency of parts and performance – critical in the world of racing. That’s the fast-paced world of racing, when yesterday is never soon enough. But she also realized she had her work cut out for her. Today, Roush Yates Engines builds more than 1,000 high-performance race engines every year, for some 128 events around the world. It’s a very fast pace and a complex process with a lot of moving parts – literally. Each FR9 engine, as just one example, has more than 600 parts that need to be inventoried, tracked, and analyzed as efficiently as possible.In one case, engine analysis revealed excessive variances between some of the engines, even though each one was theoretically identical. What they discovered was that some of the engine builders needed to modify certain parts prior to assembly. And because each one did it a little differently, they got different performance results. A similar story comes from Rottler Manufacturing, another key RYE partner. For a long time, cylinder blocks were honed essentially by hand. It takes a very skilled pair of hands to do it well, and each craftsman has a little different technique. 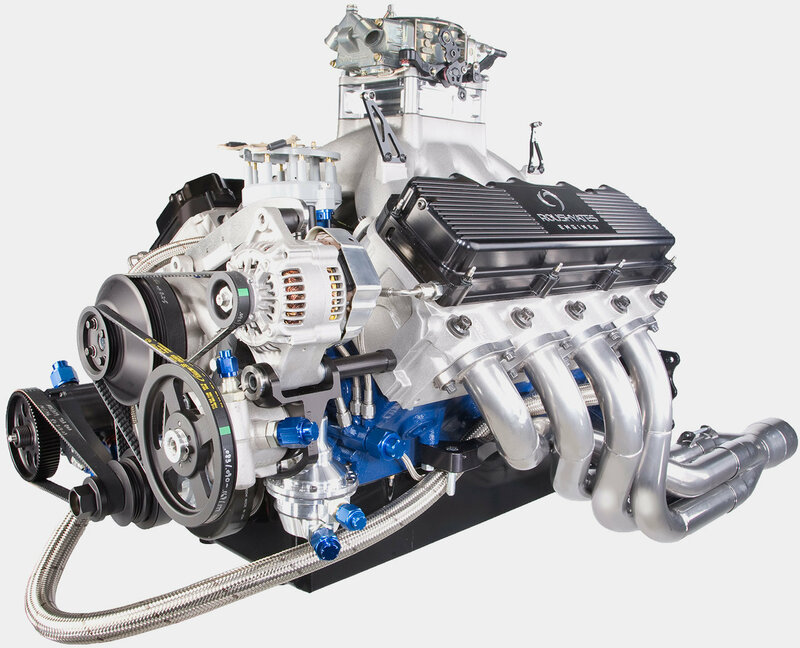 The result, again, was that different engine blocks had ever-so-slightly different finishes, explains Todd English, Roush Yates Engines Vice President, Business Development. It was innovations such as this, English adds, that enabled RYE to sign more top racing teams such as Team Penske and Stewart-Haas Racing. This forward-thinking attitude is vital. It starts at the top and extends throughout the entire team. You can even see it in the state-of-the-art facility, which is so clean and pristine you could almost mistake it for a medical research lab. Doug’s, Robert’s, and Jack’s vision for the infrastructure, the facility, repeatable processes, and having the very best people in every position provided the building blocks that set the company up for success for the Ford FR9 project. And the development of the FR9 engine would not have been possible. It would be a cliché, of course, to say that RYE’s people make the difference – but it would be true nonetheless. It starts at the top with a true racer’s attitude and reaches down to every employee in every department. Everyone is focused on getting better every day and working hard to be the best team in the business. As Marc Hayes, NASCAR Track Support and Logistics Manager at RYE puts it, “If your department is inventory control, we want it to be the best inventory control department there is. If you’re working in the hone shop, or in the dyno department, or wherever, we’re racing every guy, every department, every day.”When a team wins a race, they celebrate together. For a Monster Energy NASCAR Cup win, everybody gets Chick-fil-A biscuits on Monday. And always, for every race win, a framed checkered flag goes up on the wall. Today more than 300 winning flags line the walls of the company headquarters, a site which never fails to drop the jaws of first-time visitors. More wins are certainly on the way – for the Ford FR9 and other Ford engines such as the Ford EcoBoost V6, which powered the amazing Ford GT to victory in its 2016 return to the legendary 24 Hours of Le Mans in France. Many employees come from Universal Technical Institute (UTI), an elite technical school with a campus right in Mooresville, N.C., that has partnered with Roush Yates Engines to provide highly skilled personnel and specialized training programs. They were especially crucial in the months immediately following the merger, providing new graduates who were ready to jump in and contribute right out of the box. Right now, however, all eyes are focused on the premier Monster Energy NASCAR Cup Series, as five Ford drivers from five different Ford teams, with seven wins between them, head into the playoffs. As the drivers and their teams vie for a historic championship, they each carry with them the proud legacy of Ford Performance, the pride and passion of Roush Yates Engines, and the power and reliability of the Ford FR9 engine. There’s a lot of racing still to come, but spirits are high, fueled by the outstanding performance of the Ford FR9 engine and all the men and women who contribute to its success. No matter what the playoffs have in store, 2017 will be a year to remember for Ford fans everywhere. © Copyright 2019 Roush Yates Engines. All Rights Reserved.